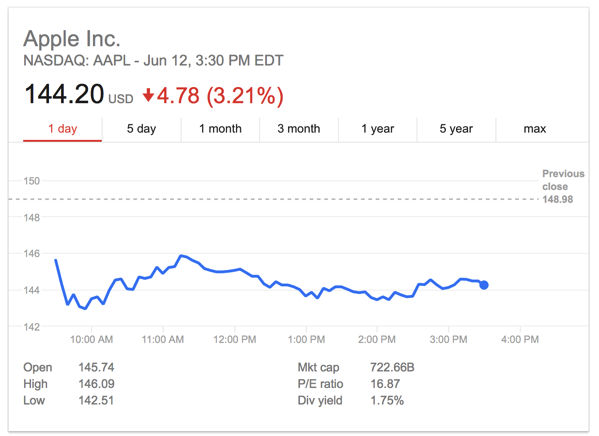 For a second straight week today, Apple’s stock (AAPL) has taken a dip following a broker downgrade, with shares going down as much as 3.6% to $143.59, the biggest drag on the three major Wall Street indexes, Reuters reports. Last week, Pacific Crest Securities lowered its rating on Apple stock to “sector weight” and today, Mizuho Securities has cut its rating on AAPL to “neutral” from “buy”, while reducing its price target to $150 from $160. “The stock has meaningfully outperformed on a year-to-date basis and we believe enthusiasm around the upcoming product cycle is fully captured at current levels, with limited upside to estimates from here on out,” said analyst Abhey Lamba. Of the 46 analysts covering Apple, 11 now have a hold rating, according to Thomson Reuters data. There is one “strong sell” rating on the stock and the remainder are “buy” or higher. The median price target of $160 is up from $145 three months ago. 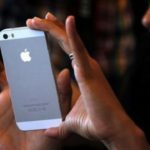 Apple’s shares also slumped on Friday after Bloomberg News reported that iPhones launched later this year will use modem chips with slower download speeds than some rival smartphones. Nonetheless, the Cupertino giant’s shares are still up more than 23% for the year. The company’s stock has added about 185 points to the Dow’s climb this year, behind only Boeing, McDonald’s and 3M Co.